Gentlemen, it's time. 3 years' worth of time. The Reserve List is no more. Brushes will be available to the general public starting tomorrow. The list is winding down and nearing the last entries from early 2016, close to 4 months after the list was opened. As I work through the end of the list, some guys are purchasing a brush right away, but some are responding after 3-5 days saying they are not ready to purchase or are no longer interested, and all in all it's becoming a more drawn out process for me and those remaining on the list. This is completely understandable, as those who signed up later are more likely to not be as active in the shaving community as those who signed up within minutes of the first list announcement. Also, 2+ years is a long time to wait for a shaving brush, and surely some folks view that as a customer service shortcoming, no matter how great the brushes are. That's totally ok. Nevertheless, at this point I've done all I can possibly do for the shaving community and those who've wanted a brush despite the demand/supply ratio. It is simply no longer viable for me to sell a $200-$250 product in such a slow and drawn out manner. I enjoy exchanging emails with patrons; I'm speaking purely from a responsible business sense. After all, my email signature does read "Proprietor / Craftsman", with "proprietor" being first for a reason. Without the business, there's no craft. It's the world we live in. I truly hope you guys can appreciate the Reserve List and my best attempts at fulfilling it. Furthermore, naturally, as a craftsman, your creative side takes over and some pieces get made that don't fit the mold. If a brand stops developing new products, it eventually gets left in the dust. It's been difficult to offer anything new to those on the list, often those who signed up for a brush have wanted the exact brush they requested with no variations. To have offered these to the general public would have created a backlash from those with reservations, to contact the rest of the list one by one to see if they're interested in said variations gets even more complicated, and well, it's not hard to imagine how something as simple as selling a shaving brush can get extremely convoluted. Just one example of the friction that a reserve list creates for the growth of a brand. I haven't introduced any new colors since the launch, with the exception of some Carbon pieces. I haven't introduced any new handle styles, despite my creative gears still continuing to turn. All that must change for The Varlet to remain competitive. To those who've been critical about the list and my approach, I hope we can turn over a new leaf going forward, because the past is the past. Decisions were made, whether they're right or wrong is another blog post altogether (which I won't be doing), but we learn, we move on. If you got a purchase email but missed it or have regrets about passing on a brush, I do apologize but there's not much I can/will do. The list is done. When I posted the original reserve list announcement, I included that the list could be cancelled at any time if it became too burdensome for The Varlet's productivity as a business. That threshold was probably reached long ago but nevertheless today is the day to end the list. Since 2015, when The Varlet first launched, tastes have intriguingly been advancing towards denser, lower lofted brushes. It's quite peculiar to read a review describing a brush that I've made as having medium density, which I would consider quite high in the density realm. In another recent forum post, 53mm is considered high lofted for a 27mm brush, which again made me take note. These certainly aren't guys that were on the forums in 2010-2011. It was utterly eyebrow-raising reading an email from a customer who purchased a 28mm knot from me having an artisan handle-maker set the loft at 46mm some time ago. Or was it 48mm? Either way... absolutely insane! Certainly not making a judgement with regards to preferences, but some perspective is in order, as I feel there's a small but growing constituency that looks at traditional knot specs with some form of disdain. Believe me, I have forstner bits and know how to use them. My drill press can go another 5mm down. I say this lightheartedly, of course. Back in 2016, I had envisioned and started preparations for what I'm calling XD™ knots, and made a mention of it in my State of The Varlet post in June of that year. An innovation that I've had to sit on due to possible reserve list complications, but I'll start rolling out these brushes as soon as I can and will be making adjustments based on feedback from density fans. Density X Depth. A denser knot set at a traditionally lower loft for an extremely firm lathering experience. So if you drink barrel proof bourbon to go along with your Marlboro reds, this is for you. 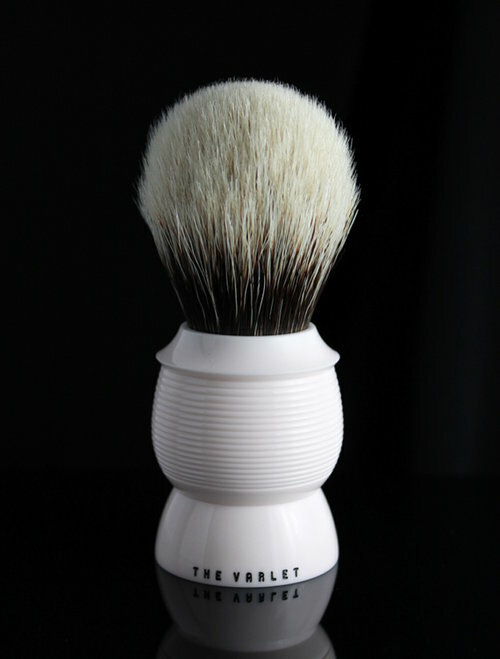 Can The Varlet make the densest brushes in the world? Of course. That is the luxury that in-house production affords a craftsman. That's the difference and that's why I have made the decision with regards to the list. Without the rigidity of fulfilling a set list I can expand the product line and ultimately those who get a brush will see the benefits of what I can craft with more freedom. That said, I still know that a majority of shavers prefer more luxurious density and loft measurements, so there will still be offerings with more traditional, well-balanced knot specifications. That will always be at the core of what The Varlet is. Time will tell what trends come and go, but what I'm most proud of and I think what fans of The Varlet love most is the subtlety and finesse, the balancing act which makes a knot perform with both power and grace. Worry not, traditionalists. Tomorrow, Monday, July 23, I will post a few Beehives in 26mm Bulb knots (not XD) in Somerset Ivory. They will be priced at $220. Traditional 2:1 loft/knot size ratio, at about 52mm. I will make them available at 12pm Pacific. I'll have some more offerings later in the week. The number of brushes offered will get larger in the next few weeks as I'm still making adjustments returning to a general sale model. Thank you all, very sincerely.